No story has been more foundational to triumphalist accounts of Western modernity than that of Martin Luther, the heroic individual, standing before the tribunes of medieval authoritarianism to proclaim his religious and intellectual freedom, “Here I stand!” How Luther Became the Reformer returns to the birthplace of this origin myth, Germany in the late nineteenth century, and traces its development from the end of World War I through the rise of National Socialism. Why were German intellectuals—especially Protestant scholars of religion, culture, and theology—in this turbulent period so committed to this version of Luther’s story? Luther was touted as the mythological figure to promote the cultural unity of Germany as a modern nation; in the myth’s many retellings, from the time of the Weimar Republic forward, Luther attained world-historical status. Helmer finds in this construction of Luther the Reformer a lens through which to examine modernity’s deformations, among them anti-Judaism, anti-Semitism, and anti-Catholicism. 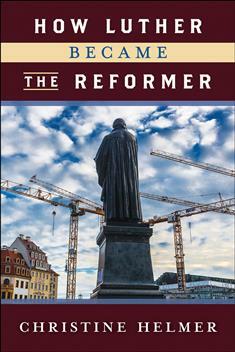 Offering a new interpretation of Luther, and by extension of modernity itself, from an ecumenical perspective, How Luther Became the Reformer provides resources for understanding and contesting contemporary assaults on democracy. In this way, the book holds the promise for resistance and hope in dark times.